Former Vice President Joe Biden speaks during the National Action Network Breakfast on January 21, 2019 in Washington, DC. Martin Luther King III was among the attendees. (CNN) - Former Vice President Joe Biden said in remarks at a Martin Luther King Jr. breakfast Monday that he has made mistakes when it comes to criminal justice issues, an area of his career that could be scrutinized if he launches a 2020 presidential bid in a competitive Democratic field. "You know I've been in this fight for a long time. It goes not just to voting rights. It goes to the criminal justice system," Biden said at the National Action Network's Martin Luther King Jr. breakfast in Washington. "I haven't always been right. I know we haven't always gotten things right, but I've always tried." 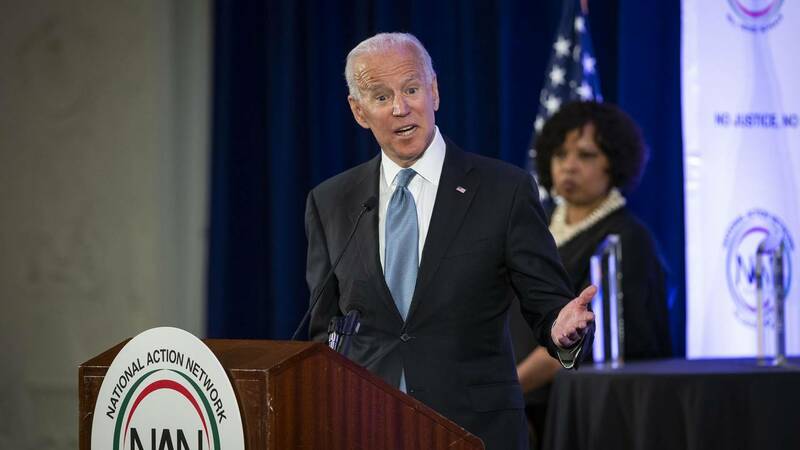 Biden made no mention of his support for a 1994 crime bill that set strict sentencing standards and, critics have argued, led to an era of mass incarceration. But he highlighted his later work with President Barack Obama to address the sentencing disparity for crack versus powder cocaine. "It was a big mistake when it was made," he said. "We thought, we were told by the experts, that crack you never go back, it was somehow fundamentally different. It's not different. But it's trapped an entire generation." The former vice president also argued that white Americans must acknowledge systemic racism still exists. "There's something we have to admit -- not you -- we, white America, has to admit, there's still a systematic racism and it goes almost unnoticed by so many of us," he said. Biden's speech -- made on Martin Luther King, Jr. Day before a group founded by the Rev. Al Sharpton -- serves as a possible overture to black voters as he mulls a 2020 presidential run. Biden, who was honored at the breakfast, is expected to make a decision about a White House bid in the coming weeks, but an announcement about his intentions may not come until later this winter or early spring. In the meantime, Biden's political team is working to lay as much groundwork for a possible campaign as they can even without an assurance Biden will run. The former vice president has kept a relatively low profile in recent weeks as he's entering the final stages of his 2020 decision-making process. His speech on Monday marked his first public appearance in more than a month. At the MLK breakfast, which was also attended by former New York City Mayor Michael Bloomberg, Biden argued the current administration has fostered hate and prejudice. He specifically pointed to the violent clashes over race in Charlottesville, Virginia, in 2017, though he didn't mention President Donald Trump -- who drew an equivalency between white supremacists and people who were there to protest them -- by name. "We've learned in the last two years, it doesn't take much to awaken hate, to bring those folks out from under the rocks," Biden said. "That part of American society has always been there. Will always be here. But has been legitimized." As he ended his remarks, Biden stressed the need to carry on King's legacy. "The next generation is coming to carry it forward, so don't tell me there's no reason for hope," he said. "I've never been more optimistic at the end of the day. I still believe that dream is in our reach."